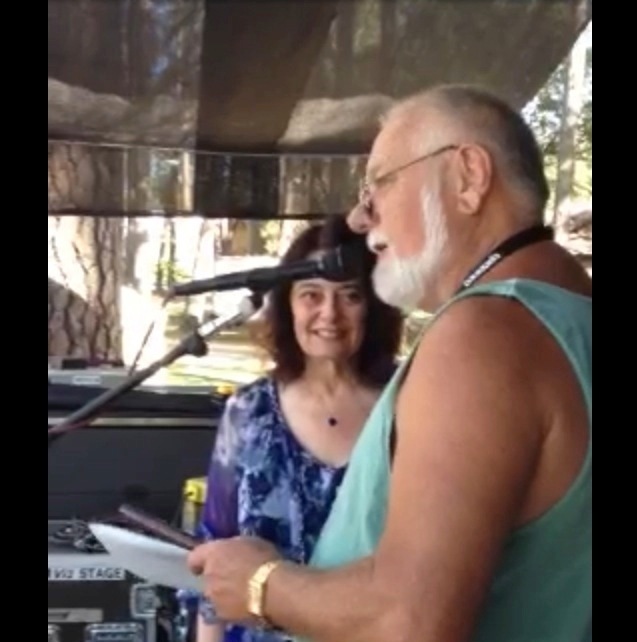 This cell phone photo (by John Reischman) from the 2013 Father's Day Festival at Grass Valley shows California Bluegrass Association President Rick Cornish presenting a Lifetime Membership Award to ... me! As I was unable to attend, Kathy Kallick is waiting to accept it on my behalf. This is a huge and completely unexpected surprise. Although I feel unworthy -- I've been a Californian for only the last 20 years and I'm not a picker -- I am deeply honored and most appreciative to be joining the distinguished group of people who the CBA feels have made significant contributions to the development of bluegrass in California. Thank you very much to Rick and Darby Brandli and the CBA Board Of Directors for selecting me. I'll do my best to continue advancing our music in whatever ways I can. And thanks to Kathy for being there for me, and for being everywhere, all the time, for me.